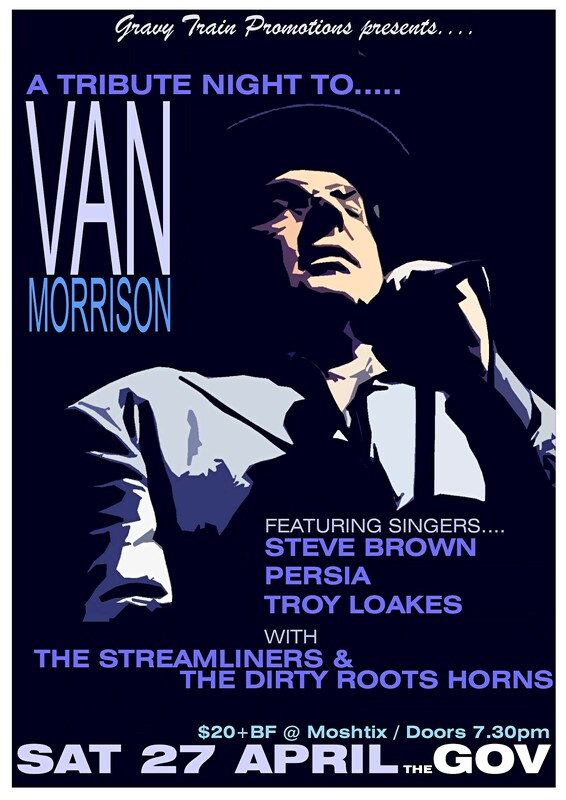 Gravy Train Promotions bring to you an amazing night of music dedicated to the master of R&B songsters VAN MORRISON!!! Come and hear great renditions of his songs performed by some of the cream of established Adelaide artists. The amazing talents of three separate singers, Steve Brown (The Steve Brown band), Persia and Troy Loakes ( Huckleberry Swedes) all perform a set each with the backing of the award winning and institution of roots music “The Streamliners” and their “Dirty Roots” horn section to pay homage, (for one night only), to one of the R&B greats. Tickets @ Moshtix or at the Door. $20 + BF or special group bookings (link below) or $25 on night…….